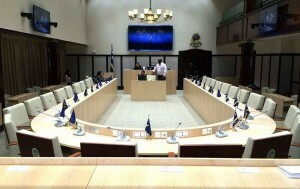 WILLEMSTAD - Today the planned parliamentary meeting takes place and the proceedings will be crucial. During the ‘illegal’ emergency meeting last Tuesday, the group of eleven Members of Parliament adopted a motion of no confidence against the caretaker government. They also wanted to replace the current President of Parliament Giselle McWilliam with the MFK MP Gilmar Pisas. But since the meeting was illegal, these motions are also not valid. Representatives of the group of eleven met with Governor Lucille George-Wout on Wednesday and were told that their meeting was not according to the rules and regulations. The group once again reiterated that it was only a reprieve because on Friday they will adopt the same motions and replace the President of Parliament with one that does have the support of the majority. The group also notified the Governor that they want to appoint Ruthmilda Larmonie-Cecilia as the ‘formateur’ of a new government that also enjoys the support of the majority in parliament. This government will take the reigns over from the current government until a new one is appointed after the elections. The Governor indicated to the group of eleven that she will answer them and motivate her decision. Parliament received this letter yesterday but did not want to comment about it. Today’s agenda is the election of a new President and Vice-President of Parliament. Probably the new majority will also resubmit their seven motions of no confidence against the Prime Minister Hensley Koeiman and the other Ministers. Another agenda item is InselAir.